Anthropics software has announced a 20% discount on all its software packages. That includes the powerful PortraitPro facial retouching software, as well as Portrait Pro Body, Landscape Pro, and Smart Photo Editor. To claim your discount, enter the FRIDAY18 discount code at the checkout when purchasing any Anthropics software package. Want to quickly enhance a portrait? Portrait Professional is by far the quickest and easiest solution. Simply load in your portrait and the software will automatically detect facial features and enable the reduction or removal of spots and wrinkles in seconds. 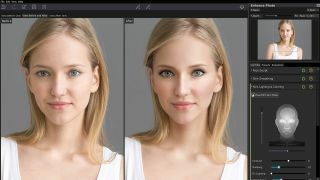 Powerful tools including advanced makeup application can add virtual makeup to models, plus there are options to add effects like skin bronzing and toning, along with one-click lens distortion removal. If you shoot portraits then PortraitPro is incredibly powerful and an essential buy that'll save you hours of time in Photoshop. Standard (was £34.95, now £27.96) includes all of PortraitPro's key features. The Studio edition (was £59.95, now £47.96) adds Photoshop, Lightroom and Aperture plugin integration along with Raw file support. The Studio Max edition (was £119.95, now £95.96) adds advanced batch processing features. Few of us will be staying trim over the coming month, but there is a way to shed the pounds without needing anything as soul-destroying as a treadmill. PortraitPro Body enables you to enhance full body portraits with body reshaping and contouring, build and height adjustment, posture correction, skin smoothing, and face retouching. This isn’t just a repackaged take on Photoshop’s Liquify tool though, as PortraitPro Body is pre-programmed with millions of images of shapes and body types to ensure results conform to correct human appearance. The latest version is faster, more accurate, and simpler to use. It also adds features like Warp Fixer that makes it easy to fix any background distortion resulting from subject alteration. Standard - includes all the headline features. It's usually £29.95, but with 20% off can now be had for just £23.96, which we think is a bargain for such powerful full-body retouching software. Go for the Studio edition and you'll get Raw file support, plus it can be run as a smart filter in Photoshop and as a plugin in Lightroom. Full price was £49.95, now £39.96. Landscape Pro is a great way to give your landscape shots a boost. It features a plethora of predefined settings and adjustments that can be quickly applied to your images to enhance colour, dynamic range and tone. It can even replace bland skies with a few clicks. Where Landscape Pro really stands out is with its ability to quickly select areas by dragging and dropping tags such as Sky, Grass and rock. Then software analyses those regions and applies tailored adjustments. There are also manual adjustments if needed, rounding out this compellingly smart software. Standard (was £29.95, now £23.96) includes all of LandscapePro's key features. The Studio edition (was £49.95, now £39.96) adds Photoshop, Photoshop Elements and Lightroom plugin integration along with Raw file support. The Studio Max edition (was £99.95, now £79.96) adds advanced batch processing features plus a histogram panel for advanced editing.